As if there wasn’t enough sourdough floating around at home at the moment! I was at Brasserie Bread in Botany the other day and just had to buy a sour cherry loaf. The occasion was a farewell for some dear friends who are sojourning in Darwin for a little while. Actually not so little, but let’s not get into that, I might need another slice or two if we do. 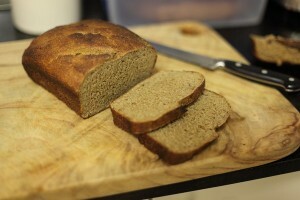 This is a wholemeal spelt sourdough using an organic white flour starter culture as the only raising agent. The shape of these loaves is called a ‘batard’. This is a light rye loaf made with a blend of organic white and organic rye sourdough starters plus a little additional fresh yeast for a lighter texture. Also, I used a loaf tin to try to create a more easily toastable bread. The little slices of the first loaf were hard to get out of the toaster! 1. One of the most prized parts of sourdough is the chewy crust and to create this you need steam in the oven. To create this I crank up the oven (I did about 220C fan-forced) with a tray of water sitting on the bottom of the oven. By the time the oven heats up and is ready for the bread to go in the water is normally bubbling and you have your steam to create your nice crust. Julia Child has a different method, she uses a piping hot brick which she adds to the tray of water to create a real burst of steam. 2. I find that the loaves burn quite quickly in my oven so I put the racks as low as possible and turn the heat down to 200 or 190 if the bread starts to brown too much. If it looks like it is going to go very brown you can cover the loaf with alfoil. 3. Bourke St Bakery’s cookbook recommends using filtered water and organic unbleached flour. 4. There is a trick that I haven’t used yet but am keen to try. Julia suggests using a terracotta tile to bake your bread on which you pre-heat, like when making pizzas the Italian way. This is meant to give an extra push from the heat underneath the loaf and help give a higher loaf. I have been experimenting with Sourdough starters or ‘ferments’ for a while. A while because for months now I have been feeding flour and water to ‘the baby’as it has come to be known and have only just made my first successful sourdough loaves. November and December were a little busier than expected which is why I’ve been so quiet. My first attempt at making sourdough last year was very dense as I ignored the suggested rising times and this is not the time to be making up the rules! Once you are proficient, sure, but in the meantime I am taking advice from the Bourke St Bakery cookbook for good notes on making a successful starter culture using just flour and water and Julia Child’s very detailed notes on troubleshooting when baking. Very helpful. 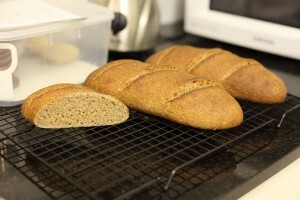 So I made some wholemeal spelt loaves, which were nutty and delicious, though still a little dense so I think I may have under-proved them, but I am looking forward to today’s batch of light rye which in addition to the traditional sourdough starter also employs some fresh (compressed) yeast to make for a tasty bread with a lighter texture. I was worried I wouldn’t be able to find fresh yeast but I bought some at the deli in Carlingford Court! Hope you all had a wonderful Christmas and New Year. You are currently browsing the archives for the Sourdough category. Entries (RSS) and Comments (RSS). 32 queries. 0.237 seconds.